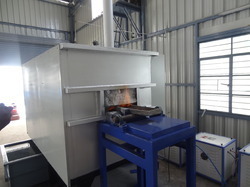 Technotherma India (Pvt) Ltd. offers Shaker Hearth Furnace. Shaker Hearth Furnace are ideally suited for continuous hardening. These premium quality Shaker Hearth Furnaces are suitable for heat treatment of mass produced and continuous hardening. 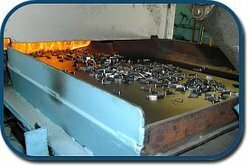 Our furnaces can be used for heat treating the small and medium size ferrous and non ferrous components under varying or protective atmosphere. These furnaces are used in numerous industries and can be availed at cost-effective prices. These types of Furnaces have a melting chamber fitted with Burners & Recuperator. After Melting the Aluminum the furnace tilts on a desired angle in order to discharge the molten metal. Tilting arrangement can be either Hydraulic or Mechanical type. Backed with talented team of professionals, we are involved in offering unmatchable quality of Shaker Hearth Furnace. This Shaker Hearth Furnace is extensively used in various suitable applications. Moreover, the offered products are available in market in different sizes and specifications. Shaker Hearth Furnace, is one of the most effective furnaces for heat treatment applications which are performed under changing or protective atmospheric conditions. These comes under the category of our one of our most popular furnaces and is designed and developed as per the clients' specifications. We have an exclusive range of Shaker Hearth Furnaces offering to our clients. All these equipment are highly demanded due to unmatched design, smooth functionality, high performance and many more salient features. We procure quality raw material from trusted vendors to manufacture these products.